Moorcroft is one type of English ceramic ware that can be dated fairly easily using marks. William Moorcroft founded his own pottery company in 1913. He worked as a potter prior to that time when he went to work for James Macintyre & Company Ltd. located in Burslem, Staffordshire, England starting in 1897, according to Warman’s Antiques & Collectibles edited by Noah Fleisher. “The manufacture of “Florian Ware” has been discontinued by James Macintyre & Co., and will hereafter be produced at the Moorcroft Works, which are now being erected at Cobridge, Burslem, England,” stated the Crockery and Glass Journal in 1913. 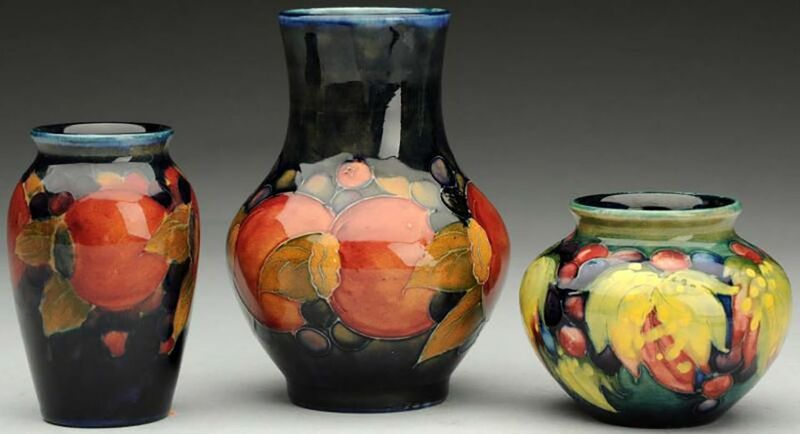 Moorcroft won accolades for his pottery work early on. Among those awards was a gold medal at the St. Louis International Exhibition in 1904. After garnering more praise and furthering his own business, Moorcroft was appointed potter to Her Majesty The Queen in 1928. After his father passed away in 1945, Walter Moorcroft continued the business bearing his family name. He not only followed in his father’s footsteps as a potter, but he also continued to make the same type of wares. In 1962, the Moorcroft family purchased the business from Liberty, but the company floundered for years in terms of prosperity. The company changed hands several times in the 1980s and ‘90s. The Edwards family took over in 1993 and continues to successfully operate Moorcroft today. Moorcroft enamels were made from 1998 only through 2006. The short life of that division of the company is attributed to those in the know to the result “of clashes in design style.” Even though the enamels didn’t last, the pottery made by this company lives on. Moorcroft markets more pottery globally today than ever before, far exceeding the output of the early 1900s. Congruently, since the newer pieces are more prolific, they are not as avidly sought or highly valued by avid art pottery collectors as the older wares. Using marks and back stamps to decipher the age of a piece will also help in determining the desirability in the secondary marketplace. Because many Moorcroft wares were hand formed – or “thrown” in pottery terms – even pieces with similar decoration vary in terms of size and shape, according to Warman’s. Most dealers and collectors refer to the colors and variations used in the decoration of the pottery, which changed a bit over the years, along with marks on the pieces to determine their age. Early works reflect William Moorcroft's association with James Macintyre & Company Ltd. These pieces usually have a Florian Ware backstamp along with a W. Moorcroft signature or initials, as noted above. When William Moorcroft established his own pottery, the W. Moorcroft signature was used along with Moorcroft and/or Burslem incised into the clay. Pieces made for export were marked England beginning in 1916 and then Made in England from 1918 onward. After the royal pottery appointment, a “Potter to HM Queen” mark was used along with a facsimile W. Moorcroft stamp rather than a hand signed version. A paper label is also sometimes found on Moorcroft pieces. This Royal Warrant label was updated over the years to reflect the change in the monarchy. In 1936, after the death of King George V, it read “Potter To HM Queen Mary.” The Royal Warrant was transferred to Walter Moorcroft in 1946, and labels thereafter read “By Appointment Potters To The Late Queen Mary.” The Royal Warrant expired on the anniversary of the Queen’s death in 1978. Various other marks, including those reflecting Walter Moorcroft’s direction of the company, were used from the late 1940s until the business left the Moorcroft family’s control. One thing these have in common is that they are all impressed Moorcroft regardless of the other initials or accompanying marks. The most recent marks show the signature of a successful artist and designer Rachel Bishop along with a copyright mark and the year a piece was made. They are still marked Moorcroft as well, along with Made in Stoke on Trent England. Who Was the "Mad Potter of Biloxi?"